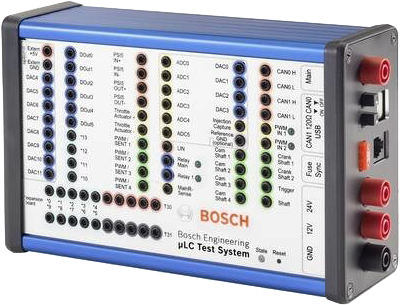 The hardware-in-the-loop test system µLC Test System from Bosch is suitable for mobile application. It is used for automotive control units with interfaces for sensors and bus systems such as CAN and LIN. In today’s cars, a variety of control units are installed. The complexity from the Electric and Electronic (E/E) functions are constantly evolving and, thereby, increasing the challenges for the test system. The development and testing of control units takes a lot of work and time. Bosch Engineering has developed a hardware-in-the-loop (HiL) test system that examines single functions in the early development stages, which is both time and cost effective, said the company. The complete and portable HiL test system is a practical service that can be performed at the user’s desk. The developed system allows for quality assurance for control units within the automotive industry. With its manageable measurements of 17 cm x 11 cm x 6 cm and a weight of 690 grams, the µLC test system is capable of use on the go. Assembly only requires a few minutes and testing the control unit is possible. The traditional long lead times are gone. The open-loop-system is connected to every control unit through common interfaces and bus systems within the automotive sector, for example CAN or LIN. Because of early error identification, the development phases of the control unit software will be more efficient. The control units can be used, for example, with motor and transmission control units, vehicle control units and other control units within the automotive industry. The interface allows the operator to intuitively use and evaluate data. Thanks to the clear structure of the menu navigation, the user can configure and execute tests. The system includes the hardware and Windows software (MicroLC software), as well as, services, like regular software updates and email support. In Las Vegas, Bosch presented its concept electric people mover. It uses embedded CAN networks.